Definition at line 91 of file llassetstorage.h. Definition at line 155 of file llassetstorage.cpp. References LLMessageSystem::getMessageTimeSeconds(), mTime, and TRUE. Definition at line 177 of file llassetstorage.cpp. Definition at line 197 of file llassetstorage.cpp. References LLHost::getIPandPort(), getTerseDetails(), mDataIsInVFS, mDataSentInFirstPacket, mHost, mIsLocal, mIsPriority, mIsTemp, mRequestingAgentID, and tut::sd(). 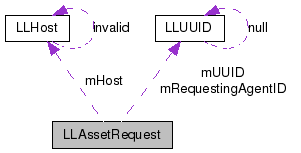 Referenced by LLHTTPAssetRequest::getFullDetails(), and LLAssetStorage::getPendingRequest(). Definition at line 182 of file llassetstorage.cpp. References getType(), getUUID(), LLAssetType::lookup(), LLAssetType::lookupHumanReadable(), mTime, and tut::sd(). Referenced by getFullDetails(), and LLHTTPAssetRequest::getTerseDetails(). Definition at line 98 of file llassetstorage.h. Referenced by LLAssetStorage::_callUploadCallbacks(), LLAssetStorage::_cleanupRequests(), LLHTTPAssetStorage::_queueDataRequest(), LLHTTPAssetStorage::checkForTimeouts(), LLHTTPAssetStorage::curlUpCallback(), LLAssetStorage::downloadCompleteCallback(), getTerseDetails(), LLHTTPAssetRequest::prepareCompressedUpload(), and LLAssetStorage::uploadCompleteCallback(). Definition at line 97 of file llassetstorage.h. Referenced by LLAssetStorage::_callUploadCallbacks(), LLAssetStorage::_cleanupRequests(), LLHTTPAssetStorage::checkForTimeouts(), LLHTTPAssetStorage::curlUpCallback(), LLAssetStorage::downloadCompleteCallback(), getTerseDetails(), and LLHTTPAssetRequest::prepareCompressedUpload(). Definition at line 102 of file llassetstorage.h. Definition at line 101 of file llassetstorage.h. Definition at line 100 of file llassetstorage.h. Definition at line 122 of file llassetstorage.h. Definition at line 121 of file llassetstorage.h. Referenced by getFullDetails(), and LLViewerAssetStorage::storeAssetData(). Referenced by LLAssetStorage::_cleanupRequests(), LLHTTPAssetStorage::_queueDataRequest(), and LLAssetStorage::downloadCompleteCallback(). Definition at line 114 of file llassetstorage.h. Referenced by getFullDetails(), and LLAssetStorage::uploadCompleteCallback(). Definition at line 116 of file llassetstorage.h. Definition at line 120 of file llassetstorage.h. Referenced by LLHTTPAssetStorage::_queueDataRequest(), and getFullDetails(). Definition at line 115 of file llassetstorage.h. Definition at line 117 of file llassetstorage.h. Referenced by LLHTTPAssetStorage::bumpTimedOutUploads(), and LLHTTPAssetStorage::checkForTimeouts(). Definition at line 123 of file llassetstorage.h. Referenced by LLHTTPAssetStorage::checkForTimeouts(), and getFullDetails(). Definition at line 118 of file llassetstorage.h. Referenced by LLAssetStorage::_cleanupRequests(), LLHTTPAssetStorage::checkForTimeouts(), getTerseDetails(), and LLAssetRequest(). Definition at line 119 of file llassetstorage.h. Referenced by LLHTTPAssetStorage::checkForTimeouts(), and setTimeout(). Definition at line 106 of file llassetstorage.h. Referenced by LLAssetStorage::_callUploadCallbacks(), LLAssetStorage::_cleanupRequests(), and LLViewerAssetStorage::storeAssetData(). Definition at line 113 of file llassetstorage.h. Referenced by LLAssetStorage::_callUploadCallbacks(), LLAssetStorage::_cleanupRequests(), LLHTTPAssetStorage::_queueDataRequest(), LLAssetStorage::downloadCompleteCallback(), and LLViewerAssetStorage::storeAssetData(). Definition at line 105 of file llassetstorage.h. Referenced by getUUID(), and setUUID().